Mediterranean and Middle Eastern people cook green beans for longer than we do. While that mutes their colour, it does wonders for flavour. You don’t have to cook them to death, just make sure they’re not undercooked. To make the tarator, soak the bread in the milk for 30 minutes. Purée in a food processor with the nuts and garlic, adding the oil and lemon juice. Add water if you want it thinner. Season to taste with salt and pepper. Top the beans. Steam or boil until just tender. 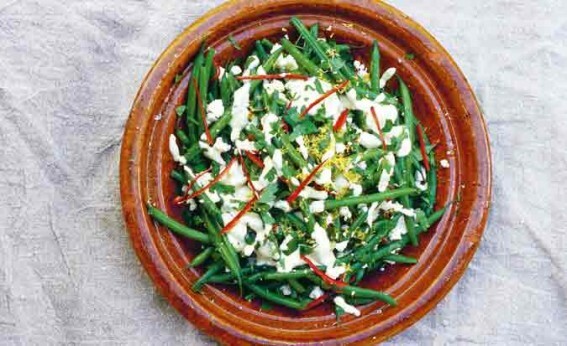 Toss in a shallow bowl with the feta, half the herbs, half the chilli, salt, pepper, lemon juice and olive oil. Drizzle with the tarator and scatter with the lemon zest, remaining herbs and chilli. These crumbs are also good on courgettes, broccoli and cauliflower. Preheat the oven to 180°C/350°F/ gas mark 4. Melt 25g (1oz) butter with 1 ½ tbsp olive oil. Mix with 1 ½ tbsp Dijon mustard, 2 tsp thyme leaves, ½ tbsp finely chopped parsley and the finely grated zest of 1 lemon. Put 75g (2 ½oz) coarse white breadcrumbs into a roasting tin and stir in the butter-mustard mixture. Cook in the oven for 10–12 minutes, until toasted, shaking occasionally. Cook 250g (9oz) green beans, topped, in boiling, lightly salted water until just tender. Rinse. Drain a 410g can flageolet beans and rinse. Heat 2 tbsp olive oil and sauté 4 chopped spring onions until soft. Add both kinds of beans, season and heat through. Scatter with the toasted crumbs and serve.